The founders of After Stories, Gurugram, Abhimanyu Boken and Harshit Arora talk to Restaurant India about the theme, new menu and food pairing at their restaurant. After Stories is located behind the IFFCO Metro Station, Gurugram, and promises a pleasing, satisfying ‘after story’ to your experience. 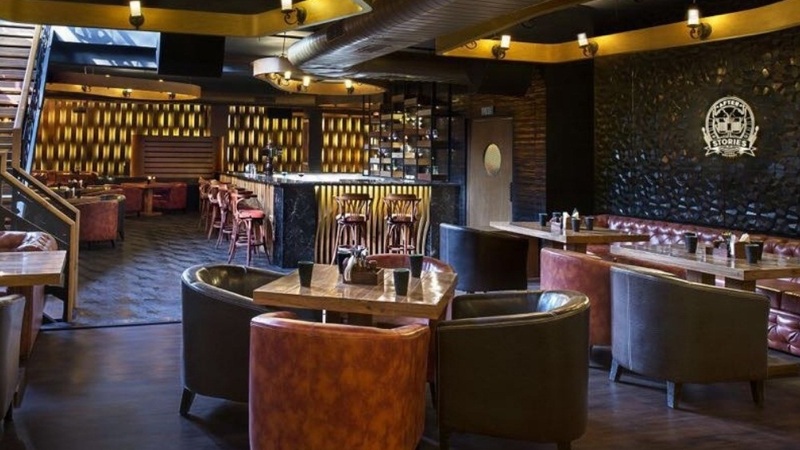 With plush interiors that have been tastefully done and the pub area spread over three floors plus outdoor seating, this is an ideal place to have a corporate get together. The founders of After Stories Abhimanyu Boken and Harshit Arora talked to Restaurant India about the theme and the menu. The restaurant is spread over three levels having a different look and gives you freshness and openness. The guests may sit in serene with a mug of fresh beer or a glass of a drink to relax and rejuvenate in lazy winter afternoon or in the evening of any season at the Open-Air Garden which is an out-and-out place for an individual to dine in or to party in a group. With our comfortable and creative interiors, we provide our guests with an upbeat vibe and friendly atmosphere. We are nesting away from the main market to provide silent and peaceful surrounding to our esteemed guests. “When we arrived with our product i.e., restaurant, a general perception was made that being away from the main hub of Sector 29 in Gurugram it will be difficult for us to survive with such huge setup. Our self-belief has proved everyone wrong! We are, now, into the third year of our product and that too very competitively.” In fact being away from the main hub i.e., Sector 29, After Stories has an advantage of the parking problem. “Parking is easily available just outside our restaurant; one can save themselves from the hustle of find place to park their vehicles in the main market.” Since the launch of the restaurant, an average footfall is approx. 6000 people a month affirm the founders of After Stories. “As restaurateurs, we would like to reach to individuals and masses. We are associated with PR agencies and have a presence on various digital marketing and social media platforms which speak about our day-to-day activities and promotions, making us visible in the market,” say the founders of the restaurant. “Our micro-brewery is the centre of attraction. As said before on each level we provide a different feel to the diners. Ground and first floor provide an Al-fresco dining experience and an area that breathes with a fresh atmosphere. Our basement area is lively with comfortable seating, amusing lightning and of course the music for foot tapping," say the founders. The menu of After Stories is designed to meet the palate of an individual, and masses. While designing the menu the restaurant has kept the quality as the priority. The raw material and ingredients used while cooking the cuisines are fresh, and available throughout the year. “We are not in a mood to make any compromise with our product which is the strength to us. We have Ala carte menu to cater the individual and fixed menu for the groups. We believe in striving for the best and offer different promos and combo to guests,” say founders Abhimanyu Boken and Harshit Arora. The cuisines on the new menu have an influence of Indian flavours. The recipes are original, yet the chef has added his own twist to match the Indian palate. As far as beverages are concerned After Stories has its own micro-brewery and produces its own crafted beer. “We have made a selection of brewmaster to match the quality standards and on our experience of travelling, consuming and tasting different kinds of Beers across the world. We focus on complete process and give full maturation time for brewing. We don’t make any compromise with our malt. We use imported malt and other raw material for the beers we serve. Our beer doesn’t consist of any artificial or fabricated product. Our products vary be it the German wheat, Belgian wheat, Apple cider, Mango Cider, Kolsch, Saison, Marzen lager, Pilsner or Stout,” told the founders of After Stories. Simultaneously, the signature cocktails are prepared with an infusion of fresh fruits, vegetables and herbs. After Stories in Gurugram has also introduced detox drinks to their menu. About us: Greetings from Rollacosta !!! ‘Rollacosta’ is brought..
Own a fresh and healthy franchise! Tie up with Juice.. These Couple-preneurs are Making Big in F&B..
Making Learning A "Child's Play".. Catering to the Growing ‘Manly’ needs..
Ambience Mall gets its First Brewery..
How Packaging Decide Buying Decisions.. The Real Taste of India..
Making the Restaurant Business More Inventive..
Nestle’s New Scheme To Curb Plastic Waste..
Understanding Customer’s Point and Preference.. The Power of High ROI Franchise Model.. The Rise of Competency-Based Learning.. Artificial Intelligence: A Reality or Illusion?..